Adding a cloud platform to your existing IT environment can often “cloud” the management of your IT resources, requiring the use of multiple management tools, which can be both confusing and labor intensive. To alleviate this, VMware enables you to leverage existing investments, processes and expertise with a hybrid cloud model that lowers your cost of ownership, while increasing productivity levels. Join us to learn more about how using VMware's vCloud suite can help you manage your critical applications and address your most pressing business needs. 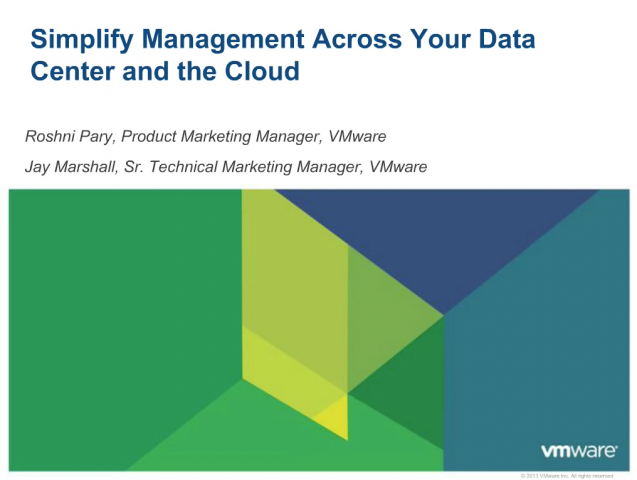 In this session, you will learn about the vCloud suite and hear how its capabilities can help you address today's top management challenges in unique and innovative ways. Whether you are a veteran with mature processes and management tools already deployed or just starting to explore the domain for the first time, you will gain valuable insight from this session about virtualization management and how the vCloud suite can be a valuable component of your overall management strategy. As virtualized environments grow and mature, businesses need to more efficiently manage, optimize, protect, forecast and identify potential risks in their architectures. VMware vSphere® with Operations Management™ enables you to achieve these goals with a purpose-built, integrated package that combines VMware vSphere, the world’s most trusted virtualization platform, with VMware’s industry-leading operations management technology. Did you know that by adopting VMware into your cloud or virtualized environment you can accelerate the deployment of regulated workloads, automate required controls to meet operational requirements and meet PCI requirements? Hear why you should upgrade to VMware vSphere with Operations Management, which includes our core virtualization product, vSphere, with the addition of performance monitoring and capacity management capabilities. In February 2014, Forrester Research conducted a global survey of over 300 IT organizations in order to evaluate the current state of virtualization in small to medium-sized businesses. View this video to learn some key findings from this research and how you can download the full report. Virtualization doesn't only improve server utilization, but can also provide business resilience when disaster strikes. In this presentation, learn how you can improve business continuity with virtualization. VMware CEO Pat Gelsinger delivers the keynote at Interop 2014, sharing a perspective on the Software-Defined Data Center as the foundation for modern data centers, empowering businesses to build a bridge to the Mobile-Cloud future. He's joined onstage by Martin Casado, VMware CTO for Networking & Security, along with two VMware customers that have deployed the VMware NSX network virtualization platform: the U.S. Department of Agriculture and the online gaming company Nexon America. Overview of how to create an dashboard for a Virtual Infrastructure (VI) Admin using the custom UI in vCenter Operations Manager. Join VP & Chief Technology Officer of Global Field at VMware, Paul Strong, as he discusses the future of IT: The software-defined data center. Millennium Pharmacy Systems saw immediate benefits in deploying vSphere with Operations Management, including greater memory and resource utilization, simple implementation that plugs directly into existing environment and a single pane of glass for management of DC environment. The team deployed vSphere with Operations Management within a day and soon discovered that every VM was oversized. Today's IT organizations are trying to cope with the pains of infrastructure inflexibility and managing multi-platform, heterogeneous environments and new application types, while continuing to battle the traditional foes of inefficiency, complexity, downtime, cost, security and compliance. VMware Cloud Management solutions enable IT to increasing IT complexity and play a new role – that of a Service Broker. VMware simplifies and automates IT management and empowers IT to govern services across multiple platforms and providers through comprehensive Cloud Automation, Cloud Operations, and Cloud Business Management. Discover how PBS Engineering and Environmental has been able to improve their business continuity and productivity with help from VMware and Dell. Choosing the virtualization platform for your business is an important decision that will impact the performance, efficiency and agility of your IT environment both today and in the future. As you consider your options, you want to make sure that your server virtualization platform will not only meet current needs, but support your future IT investments in cloud and end-user computing. In this session, we will look at the key tenets of a server virtualization platform that will help you future-proof your investment and showcase why VMware is your best choice. This is a QuickStart event using live product demonstrations to illustrate the features and benefits of a VMware vSphere environment. VMware's flagship product, vSphere, is evolving for the mobile-cloud era to address the needs of the modern data center. Learn how VMware vSphere will deliver all you need to virtualize any x86 application, at scale and with high efficiency. vSphere serves as the foundation for the other layers of the software-defined data center, such as networking, storage, availability and management. Learn more about the benefits of VMware vSphere with Operations Management, the world's leading virtualization platform with insight to IT capacity and performance. VMware provides IT organizations with solutions that deliver the operational insight to simplify and automate management of virtual and cloud infrastructures. VMware® vCenter™ Operations Management Suite™ and vCenter Log Insight™ provide a complete solution for Cloud Operations Management that helps IT manage operational governance and control through analytics and policy automation. This webcast provides a close look at vCenter Operations Management, a highly automated and integrated analytics platform that provides visibility into the health of your infrastructure and applications. VMware vSphere and virtualization is only the first step on the road to software-defined data centers. Subscribe to this channel to learn how to extend your virtualization and add management, monitoring and more.